The 2009 California wildfires were a series of 9,159 wildfires that were active in the US state of California, during the year 2009. The fires burned more than 422,147 acres (660 sq mi; 1,708 km2) of land from early February through late November, due to Red Flag conditions, destroying hundreds of structures, injuring 134 people, and killing four. The wildfires also caused at least US$134.48 million in damage. Although the fires burned many different regions of California in August, the month was especially notable for several very large fires which burned in Southern California, despite being outside of the normal fire season for that region. 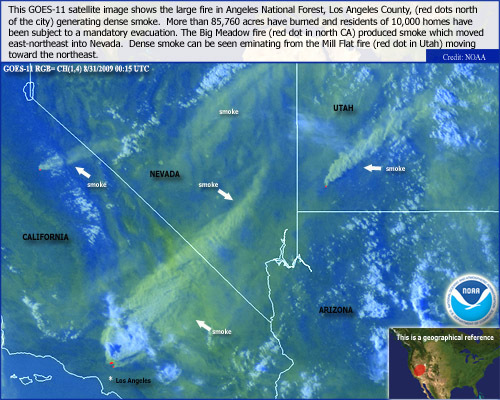 Detail from a MODIS satellite image of the Station Fire, on August 29, 2009. The Station Fire, north of Los Angeles, was the largest and deadliest of these wildfires. It began in late August, and resulted in the devastation of 160,577 acres (251 sq mi; 650 km2) of land as well as the death of two firefighters. Another large fire was the La Brea Fire, which burned nearly 90,000 acres (141 sq mi; 364 km2) in Santa Barbara County earlier in the month. A state of emergency was also declared for the 7,800-acre (12 sq mi; 32 km2) Lockheed Fire in Santa Cruz County, to the north. Below is a list of all fires that exceeded 1,000 acres (4.0 km2) during the 2009 fire season. The list is taken from CAL FIRE's list of large fires. Station Los Angeles 160,577 649.8 August 26, 2009 October 16, 2009 209 Structures destroyed, 2 firefighters killed. 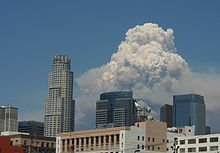 Pyrocumulus cloud from the Station Fire towers over the skyline of downtown Los Angeles, California. Invasive, non-native vegetation dies and re-sprouts year after year creating an unnatural buildup of dead plant material. While periodic fires are natural, and many native plants depend upon fire to reproduce; the intensity and frequency of these fires is altered by the presence of non-natives. In Southern California, the normal wildfire season begins in October, with the arrival of the infamous Santa Ana winds, and it is unusual to see fires spread so rapidly during other times of year. However, temperatures throughout the southern part of the state exceeded 100 °F (38 °C) for much of late August. The combination of high temperatures, low humidity and a large quantity of tinder-dry fuel, some of which had not burnt for decades, allowed some of the normal fires to quickly explode out of control despite the lack of winds to spread the flames. These conditions, along with extreme terrain in many undeveloped areas that slowed access to burn areas, made firefighting difficult. 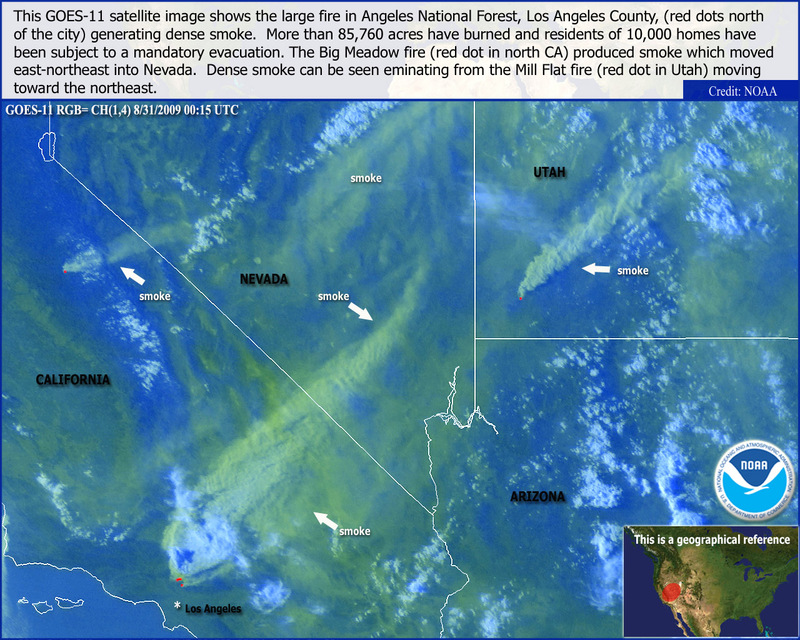 2009 California Wildfires at NASA/JPL showing the tinder-dry fuel being quickly consumed and aerial firefighting efforts to stop the blaze. Picture of Los Angeles fires in August 2009. Photo was taken from Universal Studios Hollywood. Dozens of fires burned throughout California in August 2009. Some of the most notable are listed here. The Corral Fire began on August 13 along Corral Hollow Road, outside the Carnegie State Vehicular Recreation Area, near Tracy in Alameda County. It burned 12,500 acres (20 sq mi; 51 km2) of dry grass before being fully contained on August 16. Progression of the Big Meadow Fire between August 26 and September 5, 2009. Map courtesy of the United States Forest Service. The Big Meadow Fire began on August 26 in Big Meadow, two miles (3 km) east of El Portal, just inside Yosemite National Park. As of September 4, this fire has burned 7,425 acres (12 sq mi; 30 km2) in the Mariposa County section of Yosemite, resulting in the closure of several trails, campgrounds and the portion of State Highway 120 known as Tioga Road. The community of Foresta was evacuated but residents were allowed to return on September 4. The Big Meadow Fire is 96% contained as of September 6, with full containment expected by September 10. This blaze was the result of a prescribed burn gone out of control, leading some to question the judgment of Park authorities. The Mammoth Fire started on July 16 and burned 643 acres (3 km2) in the American River Canyon and Mammoth Bar Recreation Area east of Auburn before it was contained on July 18. The fire closed the Foresthill Bridge, the highest bridge in California, for 2 days. It took 358 firefighters, 24 engines, and a helicopter to put out. The cause was undetermined as of July 18, 2009. The Foresthill Fire started on August 27 and burned 30 acres (120,000 m2) along the American River Canyon near the Foresthill Bridge before it was contained on August 28. This fire is close to the location of the Mammoth Fire. The fire took over 100 firefighters, 10 engines, 3 airtankers (planes), and 2 helicopters to extinguish. The cause was undetermined as of August 28, 2009. The 49 Fire was a small but very destructive fire that began on August 30 and was fully contained by CalFire on September 1. Although it burned only 343 acres (0.5 sq mi; 1.4 km2), it destroyed 63 homes and 3 commercial structures in the unincorporated area of North Auburn in Placer County. The fire extensively damaged 3 more homes and 6 more businesses. The fire began along the east side of Highway 49, which led to the name 49 Fire. The fire quickly spread north and east. The fire spread so quickly that some residents barely escaped their burning homes. Auburn Municipal Airport was closed during the fire, which burned right up to the runway. The fire's cause is arson. The arsonist lit a second fire just east of the original fire 20 minutes after the first fire. This added to the destruction and fire spread. This was the second fire to burn the area in 5 years. 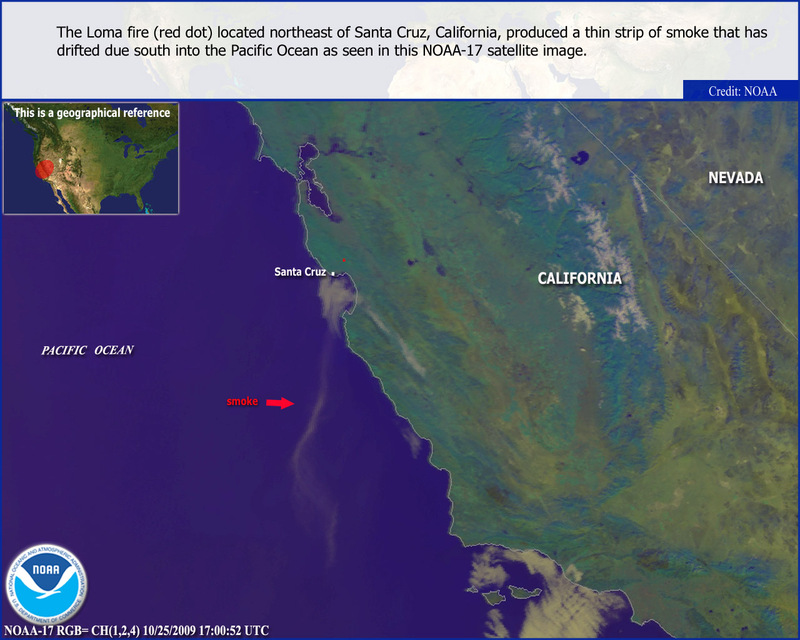 The Lockheed Fire began on August 12 near the Lockheed Martin Space Systems campus in Santa Cruz County. A total of 7,817 acres (12 sq mi; 32 km2) burned and thirteen structures were destroyed, including four seasonal cabins but no primary residences. No cause has been identified. The communities of Swanton and Bonny Doon were evacuated and a state of emergency was declared by Lieutenant Governor John Garamendi on August 14. State fire crews achieved 100% containment on August 23, at a cost of US$26.6 million. Many hillsides burned by the Lockheed Fire had not burned since 1948 due to active fire suppression in the area. Some plant species endemic to the area, including the endangered Santa Cruz manzanita, propagate only after fire, potentially allowing these rare species to proliferate for the first time in decades. The Bryson Fire started from a mobile home fire on Bryson-Hesperia Road in the Monterey County town of Lockwood. It burned 3,383 acres (5 sq mi; 14 km2) and five structures, including three homes, between August 26 and August 28. The Gloria Fire began on August 27 along Camphora Gloria Road near the town of Soledad. It burned 6,437 acres (10 sq mi; 26 km2) in Monterey and San Benito counties, destroying a house and another structure before CalFire contained it on August 31 at a cost of US$4 million. The fire was set off by fireworks used to scare away birds outside of a winery and a criminal investigation is underway to determine who is responsible. The Loma Fire (October 25–27), 669 acres (1.045 sq mi; 2.71 km2) (initially reported as 600 acres) began near Loma Prieta Way in Santa Clara County and spread to the Santa Cruz County area of Maymens Flat – Highland Road, Eureka Canyon and Ormsby. One residence destroyed with 160 structures threatened and evacuations in place for north Ormsby Cutoff until October 26. 1,742 firefighters with 4 injuries reported; cost $2.7 million. High winds contributed to the spread in the Summit area of the Santa Cruz Mountains in an area which had 6 inches (150 mm) of rain on October 13. The Yuba Fire was started after a red-tailed hawk flew into a power line on August 14, and burned 3,891 acres (6 sq mi; 16 km2) before being contained on August 21 at a cost of US$12.1 million. Two residences in Yuba County burned and power lines transporting electricity from a hydroelectric facility were threatened. The Morris Fire (August 25 – September 3, 2,168 acres (3 sq mi; 9 km2)) began near Morris Dam in the Angeles National Forest. This fire is thought to have been caused by arson. The Station Fire (August 26 – October 16, 160,577 acres (251 sq mi; 650 km2), 209 structures destroyed, including 89 homes) started in the Angeles National Forest near the U.S. Forest Service ranger station on the Angeles Crest Highway (State Highway 2). Two firefighters, Captain Tedmund Hall and Firefighter Specialist Arnie Quinones were killed on August 30 while attempting to escape the flames when their fire truck plunged off a cliff. The Sheep Fire (October 3–10, 7,128 acres (11.1 sq mi; 28.8 km2)) started near Sheep Canyon Road near Lytle Creek east of Mount Baldy and west of the Cajon Pass in the San Gabriel Mountains. Mandatory evacuations were in place for all Wrightwood residents October 4–6; the fireline held at 0.3-mile (480 m) from Wrightwood homes. Five structures had been destroyed in the Lone Pine and Swarthout Canyon areas including one residence. Eight firefighters have been injured but no fatalities have been reported. Below-freezing temperatures in the mountain areas helped fire crews in containment on October 6. Suppression costs as of 9 October 2009[update]: $7,977,000. 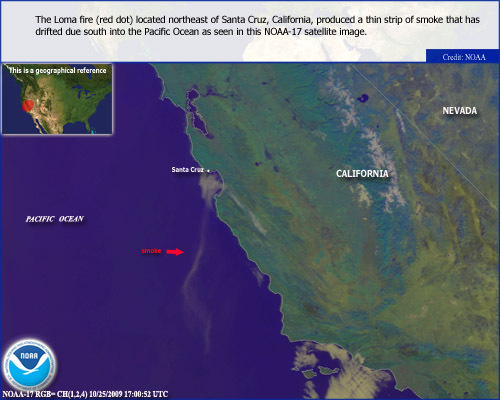 The Jesusita Fire was a wildfire that began at approximately 1:45 PM on May 5, 2009 in the hills of Santa Barbara, California. The fire burned 8,733 acres (35.34 km2), destroyed 80 homes and damaged 15 more before being 100% contained. The La Brea Fire began near La Brea Creek in Santa Barbara County, inside of Los Padres National Forest. The fire burned 89,489 acres (140 sq mi; 362 km2) of chaparral between August 8 and August 22, but only destroyed two structures—a cabin and an unused ranger station. The Guiberson Fire in Ventura County has burnt an estimated 8,500 acres (34 km2), destroying two outbuildings and injuring two firefighters. Governor Schwarzenegger declared a state of emergency. The fire, which started between Fillmore and Moorpark, has caused the evacuation of almost 600 homes in Meridian Hills and Bardsdale; about 1,000 structures were threatened, in addition to oil pipelines in the area. On September 27, the Guiberson Fire was 100% contained, after burning approximately 17,500 acres (71 km2). The cause of the fire is still unknown. ^ a b "National Report of Wildland Fires and Acres Burned by State 2009" (PDF). National Interagency Fire Center. Retrieved 19 August 2015. ^ a b "CAL FIRE 2009 Wildland Fire Summary" (PDF). CalFire. September 2011. Retrieved December 11, 2017. ^ a b c "Large Fires 2009" (PDF). CAL FIRE. Retrieved 20 August 2015. ^ Current Fire Information. California Department of Forestry and Fire Protection. Accessed October 29, 2009. ^ "Wildfire spreads along 241 toll road just east of Anaheim Hills [Updated]". Los Angeles Times. November 24, 2009. Archived from the original on November 28, 2009. Retrieved November 25, 2009. ^ "Wildland Fire Accidents and Fatalities by Year" (PDF). National Interagency Fire Center. Retrieved 28 August 2015. ^ a b Zouhar, Kristin; Smith, Jane Kapler; Sutherland, Steve; Brooks, Matthew L. (2008). "Wildland fire in ecosystems: fire and nonnative invasive plants". [United States Forest Service]. Retrieved February 17, 2011. ^ Ainsworth, Jack; Doss, Troy Alan (1995). "Natural History of Fire & Flood Cycles". California Coastal Commission. Retrieved February 17, 2011. ^ "Corral Fire". California Department of Forestry and Fire Protection. August 18, 2009. Archived from the original on August 24, 2009. Retrieved September 3, 2009. ^ Salonga, Robert. (August 17, 2009). "Corral fire fully contained after burning 12,500 acres". Contra Costa Times. Retrieved September 3, 2009. ^ "Big Meadow Wildfire". InciWeb (United States Forest Service). September 4, 2009. Retrieved September 5, 2009. ^ "A Note From Yosemite's Superintendent". InciWeb (United States Forest Service). August 29, 2009. Retrieved September 3, 2009. ^ a b CalFIRE (July 18, 2009). "Mammoth Fire Fire Incident Information". Archived from the original on September 16, 2009. Retrieved September 12, 2009. ^ a b CalFIRE (August 28, 2009). "Foresthill Fire Fire Incident Information". Archived from the original on August 30, 2009. Retrieved September 3, 2009. ^ "Forty Nine (49) Fire". California Department of Forestry and Fire Protection (CalFire). September 2, 2009. Archived from the original on September 4, 2009. Retrieved September 3, 2009. ^ a b "Fox40 News: Couple Tours Their Burned Out Home". Sacramento: Fox 40 KTXL. Retrieved September 12, 2009. ^ Thomas, Ayesha; Johnson, C. (September 1, 2009). "Firefighters Fully Contain the 49 Fire". KXTV (ABC Channel 10). Retrieved September 3, 2009. ^ Gabbert, Bill (August 13, 2009). "Lockheed fire near Santa Cruz, CA". Wildfire Today. Retrieved September 3, 2009. ^ Squires, Jennifer; Jones, Donna; Alexander, Kurtis; Kelly, Cathy; Bookwalter, Genevieve; Walsh, Austin (August 13, 2009). "Lockheed Fire update: No containment; Bonny Doon evacuated; McCrary home saved". Santa Cruz Sentinel. Archived from the original on October 16, 2009. Retrieved September 3, 2009. ^ a b "Lockheed Fire Incident Information". California Department of Forestry and Fire Protection. August 23, 2009. Archived from the original on September 7, 2009. Retrieved September 3, 2009. ^ "State of Emergency As Lockheed Fire Rages". KPIX-TV (CBS Channel 5). August 14, 2009. Archived from the original on 2009-08-17. Retrieved September 3, 2009. ^ Bookwalter, Genevieve (August 19, 2009). "Scientists excited about new rare plants: recent flames could prompt explosion of manzanita species found nowhere else". Santa Cruz Sentinel. Retrieved September 3, 2009. ^ "Bryson Fire". California Department of Forestry and Fire Protection. August 28, 2009. Archived from the original on September 17, 2009. Retrieved September 3, 2009. ^ "Gloria Fire". California Department of Forestry and Fire Protection. August 31, 2009. Archived from the original on August 30, 2009. Retrieved September 3, 2009. ^ Solana, Kimber. (September 1, 2009). "CAL FIRE investigators focus on vineyard as cause of Gloria Fire near Soledad". The Californian. Archived from the original on 2009-09-07. Retrieved September 3, 2009. ^ 600-acre Loma Fire now 20 percent contained. Santa Cruz Sentinel. October 25, 2009. ^ "Yuba Fire". California Department of Forestry and Fire Protection. August 23, 2009. Archived from the original on August 23, 2009. Retrieved September 3, 2009. ^ Grigsby, Jared. (August 16, 2009). "Difficult terrain works against Calif. fire crews". Associated Press. Retrieved September 3, 2009. ^ "Morris Fire". InciWeb (United States Forest Service). September 3, 2009. Retrieved September 5, 2009. ^ "Morris Fire was arson, official says". Pasadena Star-News. August 30, 2009. Archived from the original on 2009-09-08. Retrieved September 3, 2009. ^ Station Fire Update Sept. 27, 2009. InciWeb. Accessed September 28, 2009. Archived September 30, 2009. ^ "New fire breaks out near Angeles Crest Highway; forces road closure". Pasadena Star-News. August 26, 2009. Archived from the original on September 8, 2009. Retrieved September 3, 2009. ^ "Station Fire". InciWeb (United States Forest Service). September 4, 2009. Archived from the original on September 4, 2009. Retrieved September 5, 2009. ^ "Firefighters Killed in 'Station Fire' Remembered". KTLA-TV (Channel 5). September 1, 2009. Retrieved September 3, 2009. ^ "Below-freezing temps help in fight against Sheep fire [Updated]". Los Angeles Times. October 6, 2009. Archived from the original on October 8, 2009. Retrieved October 7, 2009. ^ Sheep Fire Update Friday October 9 8:00 Am. InciWeb. ^ Womack, Sam. (August 17, 2009). 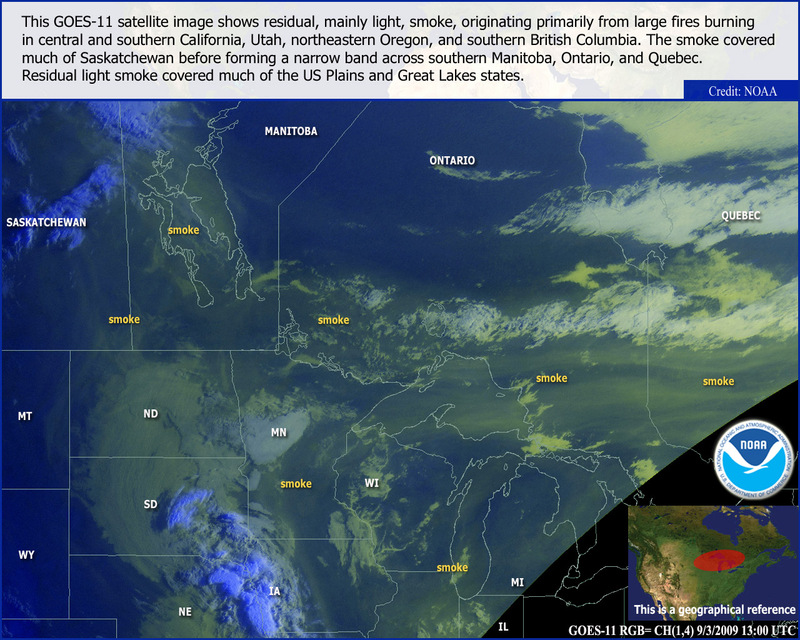 "Crews work into the night to corral wildfire". Santa Maria Times. Retrieved September 3, 2009. ^ "La Brea Fire". InciWeb (United States Forest Service). September 1, 2009. Retrieved September 3, 2009. ^ "State of emergency declared in California wildfire". CNN. September 23, 2009. Retrieved September 23, 2009. 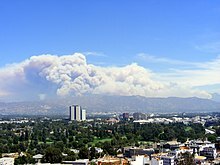 Wikimedia Commons has media related to 2009 wildfires in California.